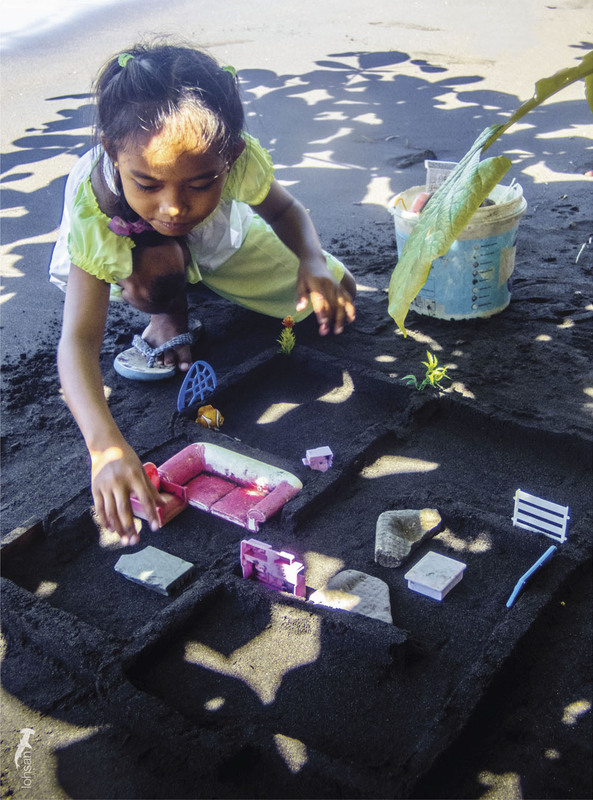 Young girl from the village playing by the sand. 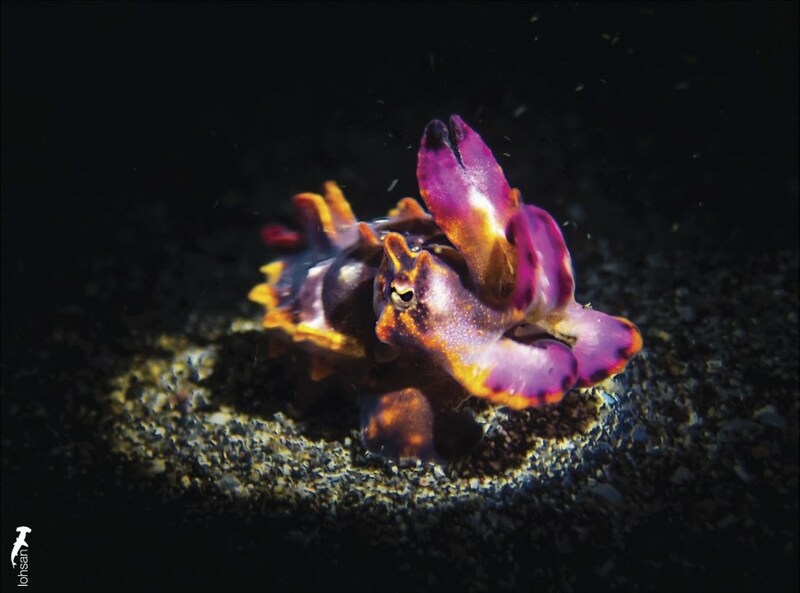 When we think of Lembeh, we think calm waters, little to no underwater currents, lots of black sand, and an amazing array of macro marine life. 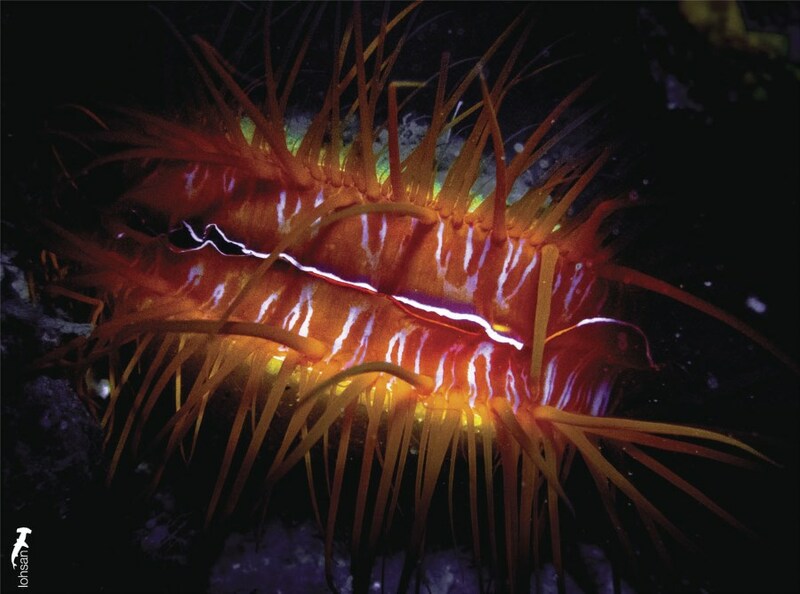 The macro life here varies in colour and pattern ranging from tiny crustaceans, slugs, nudibranchs, to small reef fishes and everything in between. 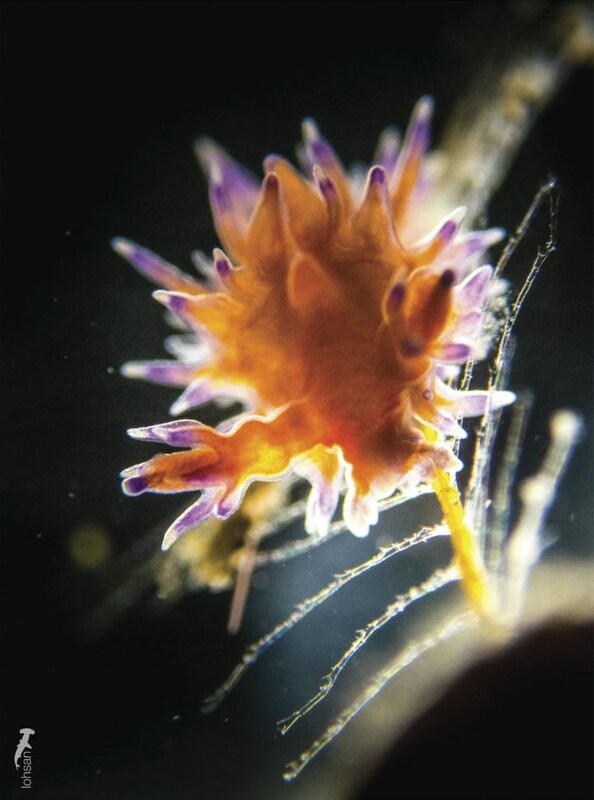 For avid underwater photographers, this is the place to go to to hone your skills at macro and super macro photography. 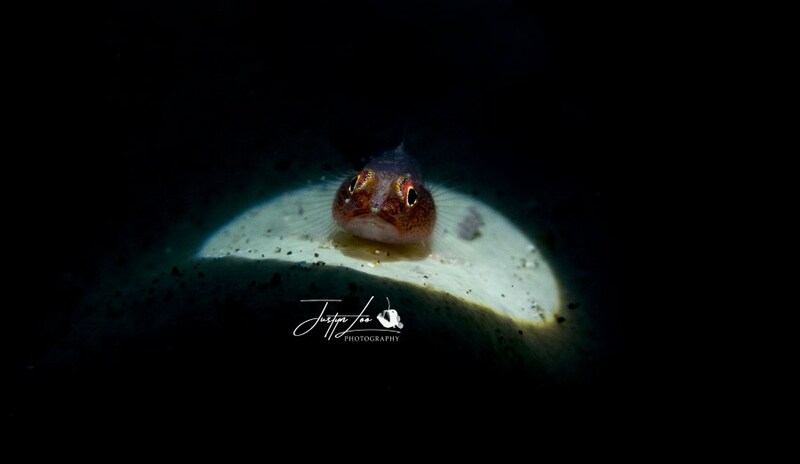 The times I spent at Lembeh taking photos has been enormously rewarding for me. 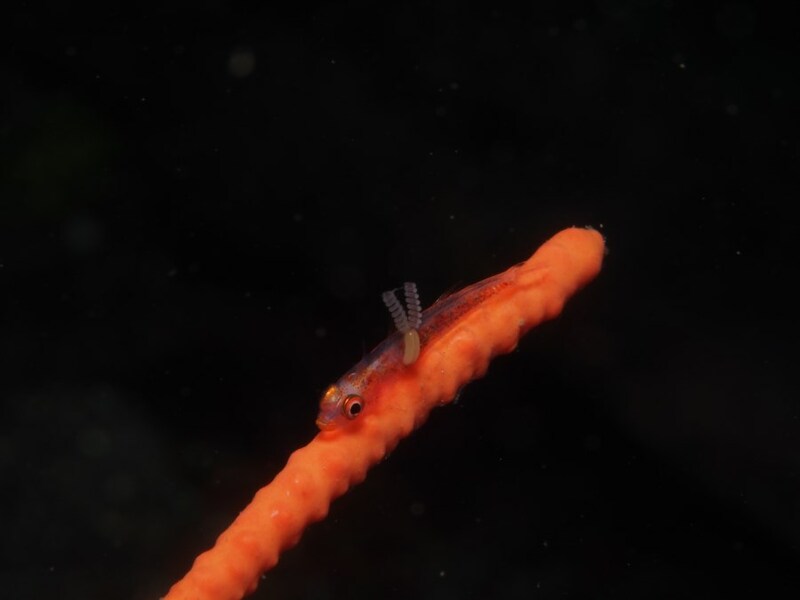 In our last trip, my family and dive buddies stayed over at Yos Dive Lembeh. It is a boutique resort owned by Pak Yos Amerta and the dive centre is managed by a well known Instructor among macro photographer lovers – Jandri Maniggolang. 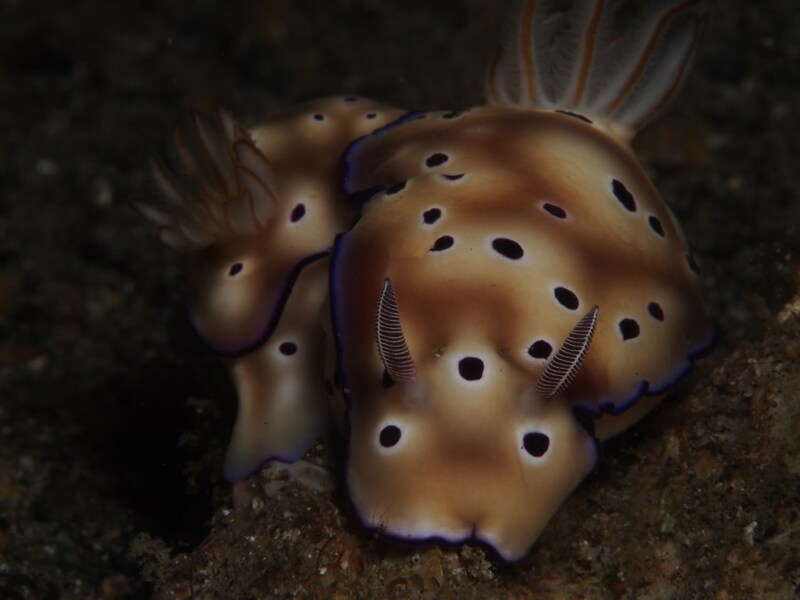 We had a great time with our guides Jaongan and Nonsix, both having keen eyes and were able to point out many creatures for us to see; and Jandri teaching us about how to take better underwater macro photos. We spent a little over a week there and almost every dive, we saw something new. We had the opportunity to experiment with various lighting styles including snoot lights, hand held strobes, video lights and a ring light. Here’s San Loh, Justyn and my results. San Loh’s current gear set up is the Olympus Tough TG-4, a popular underwater macro camera, and an INON S-2000 strobe. Video light pointing from the bottom rear of the nudibranch. 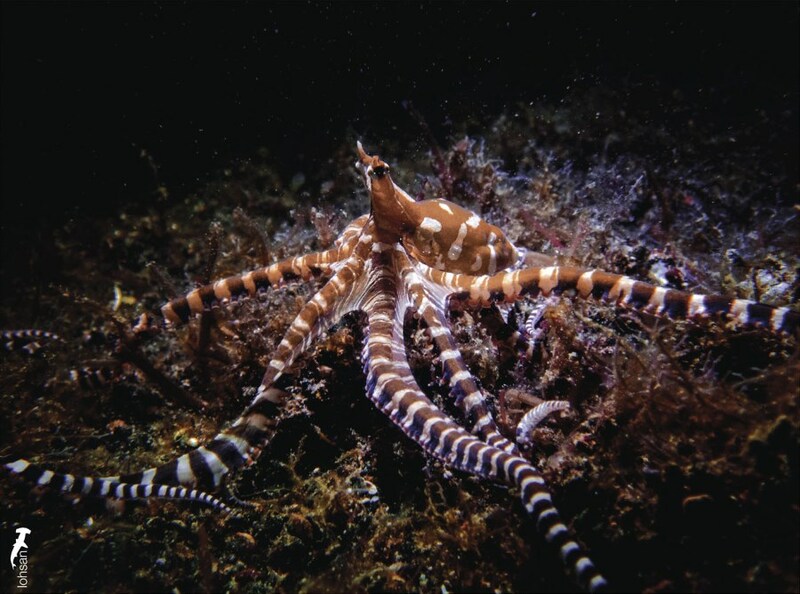 Video light placed over the wonderpus octopus. 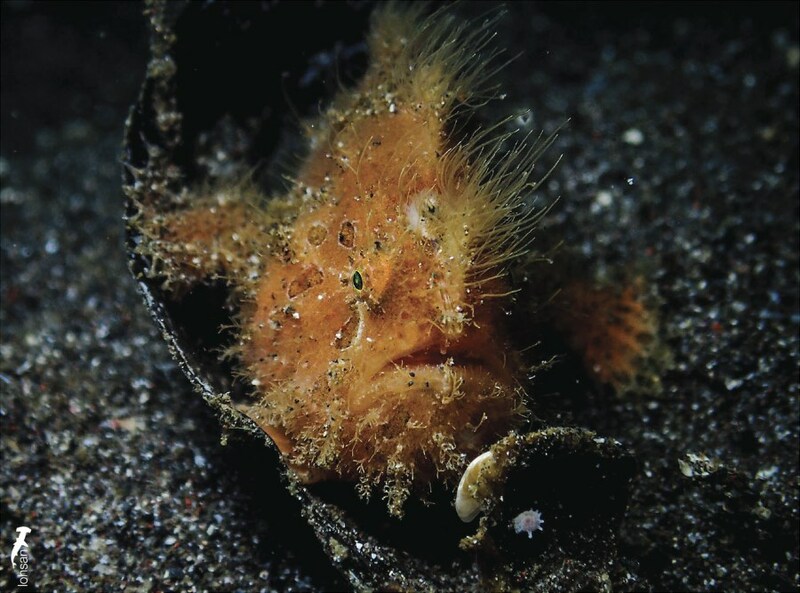 Strobe hand held on the left of the hairy frogfish. Adjusted the lighting so that the camera uses a longer shutter speed in order to see more of the electric lights running along the edges. Snoot light over a flamboyant cuttlefish. 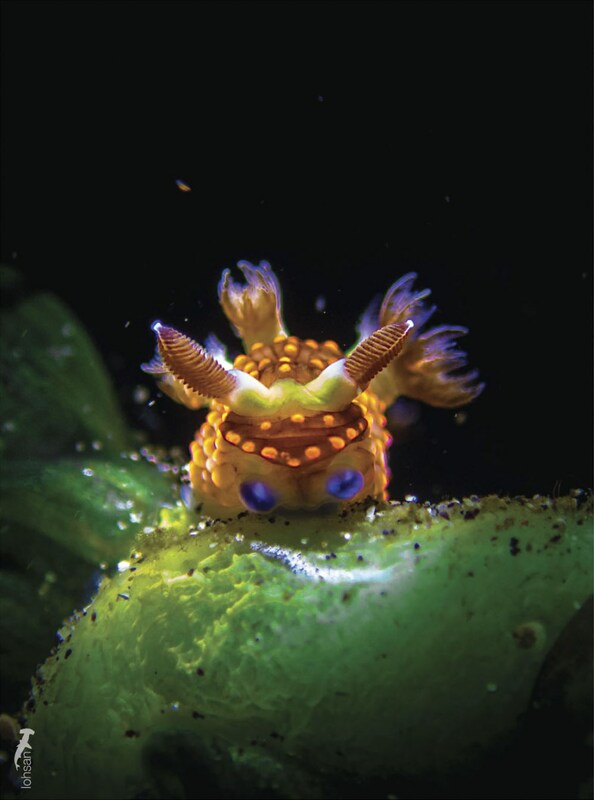 Video light pointing from the top rear of this nudibranch. 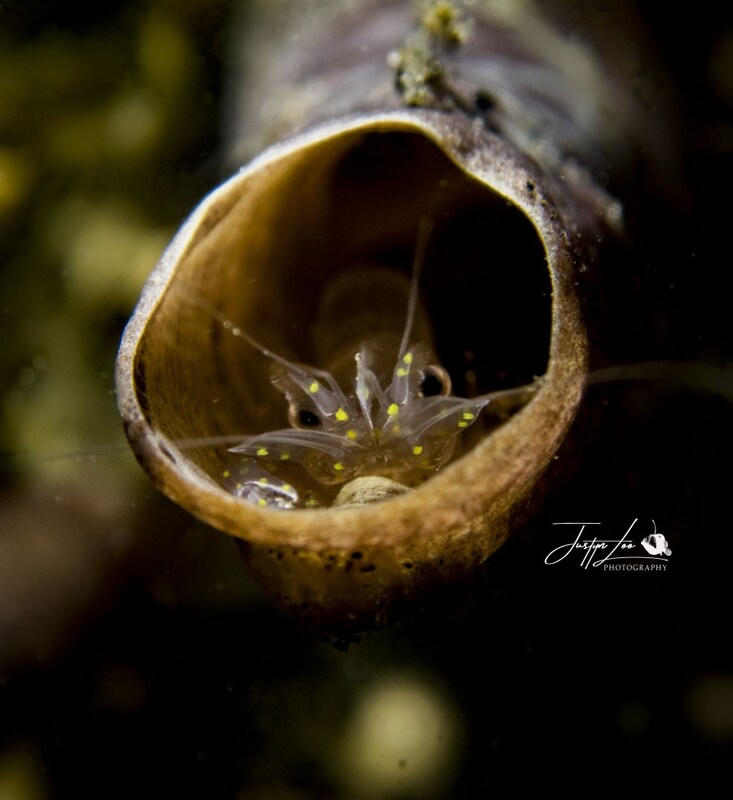 See more of San Loh’s Lembeh macro life photos. Justyn’s current gear set up is the Olympus Tough TG-4 in the Olympus PT-056 housing and a bright 1,500 lumens video light. This blue ringed octopus was lighted from the ring light attached to San Loh’s camera. Truly a Close Encounter of the Third Kind. 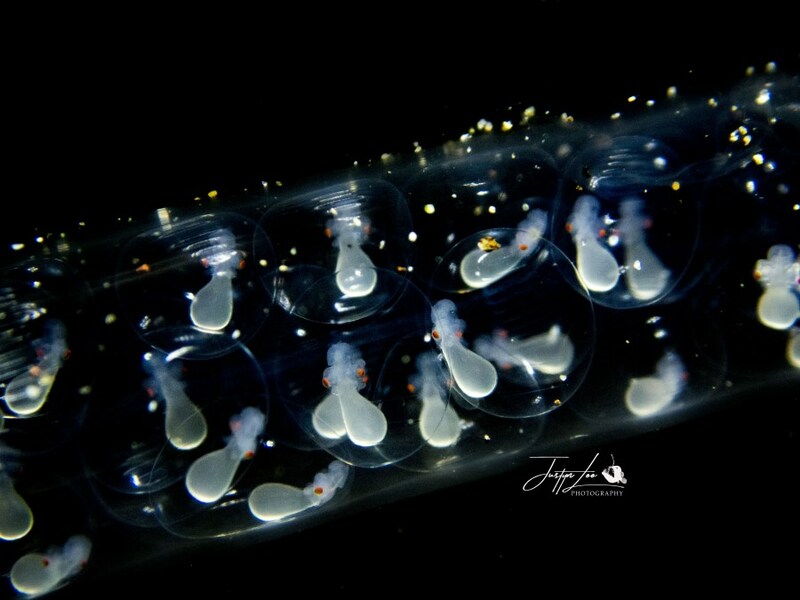 Video light from above over these tiny unhatched cuttlefish in its transparent eggs. Illuminated from the top left into a tube sponge. Snoot light from above aiming just a little to the front of this cowry. Snoot light over this triplefin fish. 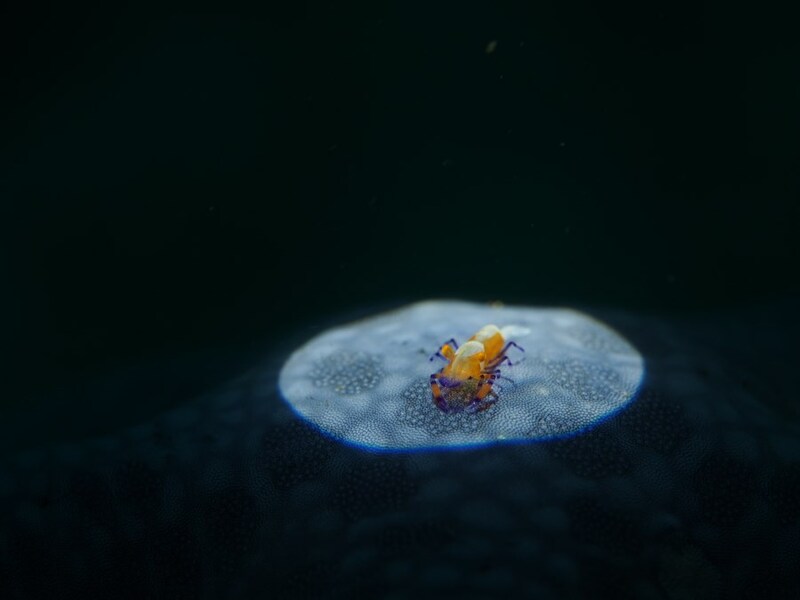 See more of Justyn Loo’s little creatures from Lembeh. My current gear set up is the Olympus PEN E-PL5 with m.Zuiko ED 60mm f2.8 macro lens in the Olympus PT-EP10 housing and a Sea & Sea YS-110 alpha strobe. 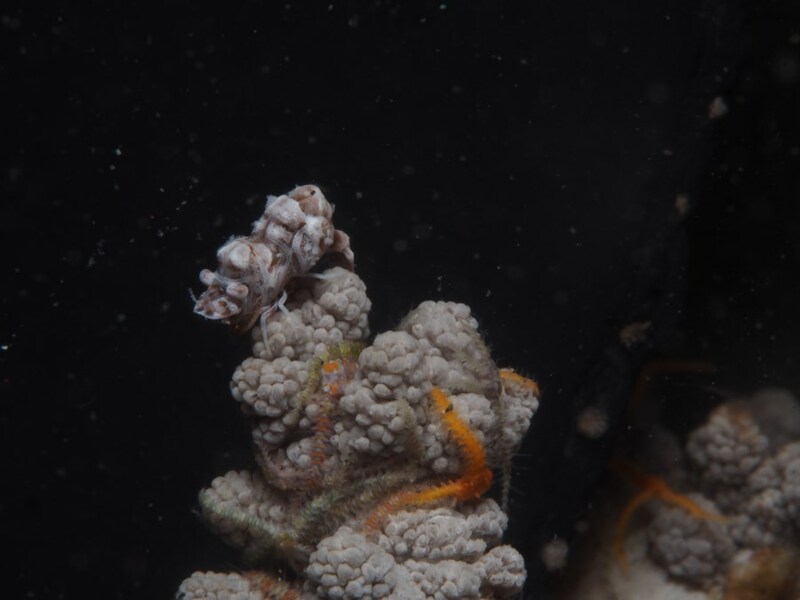 This shrimp was spotted in shallower waters with lots of ambient light. So we used a snoot light placed over the shrimp, and a black neoprene in the background. Strobe placed near the camera lens. 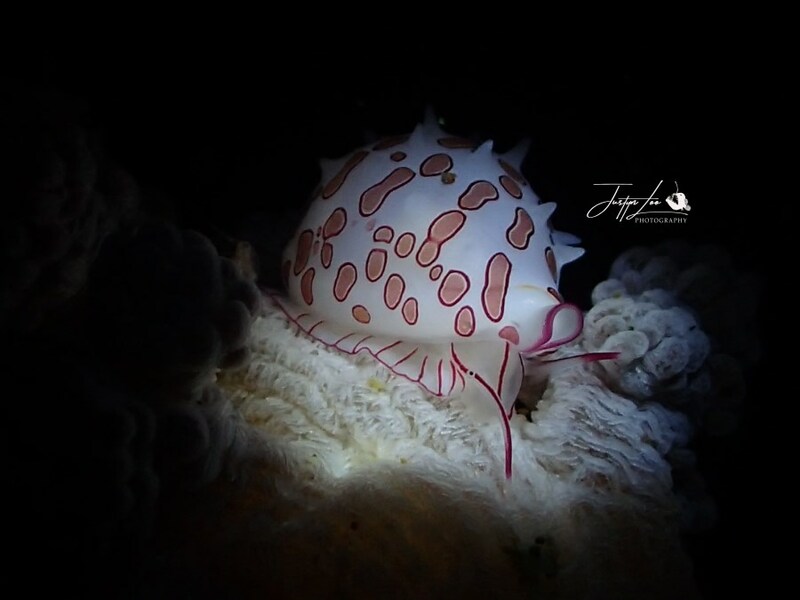 Red snoot light from the left illuminating half of this halgerda batangas nudibranch while another snoot light used to illuminate the front of it. Strobe over the top of the camera lens aimed at these two Tyron’s hypselodoris nudbranchs mating. Snoot light from above over this emperor shrimp sitting on a starfish. One of the challenges I face is that my macro lens has a minimum working distance of 0.4 m. That means, I can’t really get close enough to a tiny subject. It didn’t help that my dive buddies were really good photographers too. Oh, and I also have long-sightedness, so there’s that. I had a chance to use my friend’s Olympus Tough TG-4 and I have to say it is an amazing little camera. Being able to have the lens almost touching the subject and taking a shot really opens up possibilities in seeing all the hidden details of the tiny subject. However, I couldn’t control the shutter speed on the TG-4, so under poor light, it was difficult for me to get a sharp image because the camera seems to favour slow shutter speed over large aperture. I’m really tempted to get a similar setup to San Loh and Justyn’s just so that I can take nice photos like them too. But for now, I think I’ll still stick to my gear. It’s harder to get the shot my peers seem to be able to get so effortlessly, but I enjoy the challenge and I am sure I still have lots to learn from my current gear set up. Lembeh is located in North Sulawesi and is within the often mentioned Coral Triangle. This dive destination is fairly easy to get to. The nearest airport here is the Sam Ratulangi Airport in Manado. There are flights to Manado via Jakarta and Singapore. From the city, it’s a two hour car ride from the airport to Makawidey, Bitung where most of the dive resorts are located. 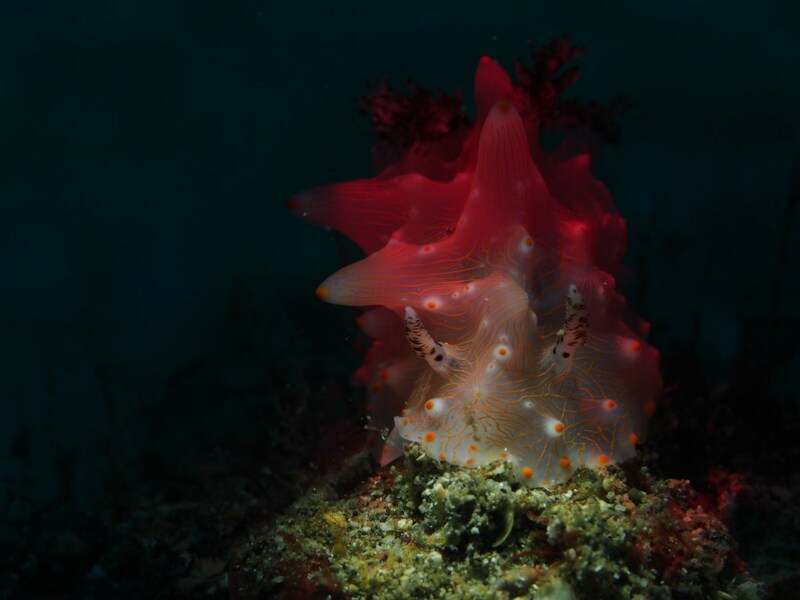 Learn more about Lembeh, best times to visit and available dive resorts. Jandri Maniggolang is the dive centre manager at Yos Dive Lembeh Eco Resort and we were fortunate to have him be our guide on our dives. He is also a well known underwater macro photographer specialising in Olympus Tough TG series cameras and has held workshops at the resort for new and budding macro underwater photographers. He is generous with sharing his underwater photography tips and we want to take the opportunity to say a special thank you to him. Jandri hails from Sangihe, north of North Sulawesi and started his diving career in Lembeh. Over the years, he has guided in other popular destinations such as Raja Ampat and Komodo before settling back in Lembeh again. 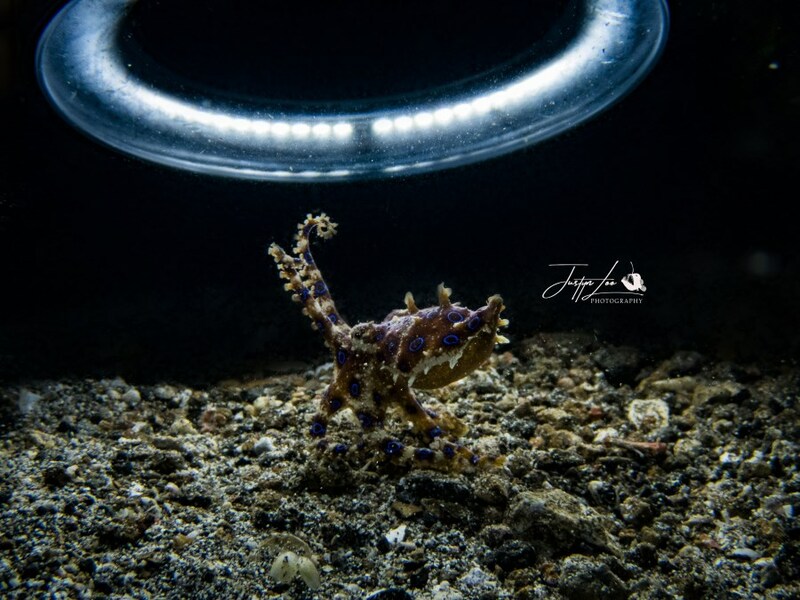 Lembeh is truly Jandri’s playground. There are at least 3 dive sites around Lembeh that are named after him: Jahir 1 & 2 (the ‘J’ in Jahir is attributed to him), and Jandri’s Beach. You can follow Jandri on his Instagram for really nice underwater photos.